WAILUKU, Maui October 31, 2016 – Ka Hale A Ke Ola Homeless Resource Centers has been named the latest beneficiary of Ohana Fuels’ “Fuel Up. Do Good” program. 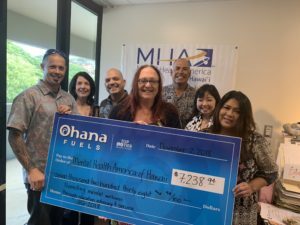 Ohana Fuels, Hawaii Petroleum’s retail fuel brand, partners with nonprofit organizations serving the needs of the local community by donating a portion of every gallon of gasoline purchased at its stations in that community. 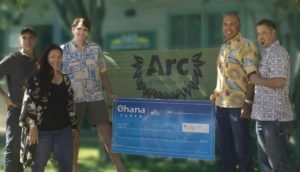 Ka Hale A Ke Ola Homeless Resource Centers received a donation of $8,265 for the period of July 1st through September 30th. Front Row Left – Kimo Haynes, President, Hawaii Petroleum, Nori Clements, Admin/Human Resources Manager, Monique Yamashita, CEO, Joelvonne Kamaka, Leasing Director, Joy Rucker, Housing Program Manager. Back Row Right- Lee Thompson, Operations and Maintenance Director, Pi‘imauna Dukelow, Development and Public Relations Coordinator, Laura Alfonso, Marketing Representative, Hawaii Petroleum. Ka Hale A Ke Ola Homeless Resource Centers have been serving the homeless community in Maui County for the past 30 years. The Center’s Wailuku and Lahaina locations provide safe and secure emergency shelter and offer nutritional meals served onsite, as well as transitional housing programs assisting as many as 1,500 individuals on Maui each year. Additionally, Ka Hale A Ke Ola coordinates a comprehensive range of programs and services aimed at empowering individuals and families to become self-sufficient, contributing members of the community. All emergency shelter and transitional housing program participants receive comprehensive case management services and have access to the onsite programs meeting their specific needs. “Hawaii Petroleum is an amazing and generous partner that truly understands the value of investing in its community. 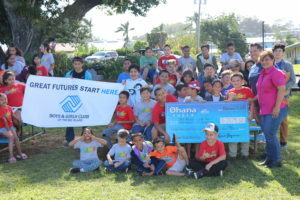 This donation from Ohana Fuels will be used to repair and begin desperately needed renovations to our childcare facility located in Central Maui. A renovated and updated childcare center will be a huge benefit to the many families with children who utilize our services”, said Monique Yamashita, CEO & Executive Director. Ohana Fuels is Hawaii Petroleum’s retail brand that provides competitively priced, quality fuels at safe, clean and convenient locations including eight stations on the Island of Maui and eight stations on the Island of Hawaii. Certified as a TOP TIER fuel provider, Ohana Fuels meets premier standard of gasoline for optimum performance and fuel efficiency. Hawaii Petroleum is committed to making a positive contribution to the communities in which its Ohana Fuels stations operate, and gives local residents a way to support the community with every tank of gas they purchase.